Maldives: great place to lose your wallet | Where Wu At? So the start of my trip has been very interesting to say the least. I didn’t notice how taxing travel was until I realized that we left Toronto on Sunday afternoon and didn’t arrive at our destination until Tuesday morning. Minus the time difference and we’ve been traveling for around 30 hours. But I must say, it’s been worth it! finally packed all my stuff into my backpack, it’s 18kg. I’m going to develop back muscles I never even knew I had! last goodbye to parents and friends in Toronto and also, goodbye to instant connectivity through internet, cellphone, bbm etc. Mom and Dad, thank you for not freaking out! Amsterdam airport: security is very particular here. They do all the security stuff at each gate and have special security people (employed by G4S or as we know them by in Toronto, our building concierge). These security people pull everyone aside at these podiums and ask all these questions that I found odd. For example, they questioned how Mike and I knew each other at least 3 times and how we were going to get around on our trip. It didn’t help that Mike and I had no idea what our itinerary is going to look like or how we were actually going to get around. Mumbai airport: very friendly and personalized service. We had this lady take us around everywhere – maybe because we looked super disoriented from being sleep deprived. She even questioned where we were going when we left the gate – Mike had to get KFC which not too surprisingly, tasted the same as in Toronto. Mumbai to Colombo to Maldives: they love fresh cold towels here and now, as do I. So refreshing and clean! Finally landed in Maldives and automatically, it felt so baller! We were ushered to this private yacht (and when I say yacht, it’s because I’ve never seen such a nice boat in my life!) and were automatically given bottles of water and again, fresh cold towels! They even let me drive the boat which now, looking back may not have been the wisest choice considering how sleep deprived and practically inebriated from excitement I was. We sped along to Kurumba resort which is on one of the North Male atolls (i.e. islands) called Vihamanafushi and was pleasantly greeted by a hostess who showed us the resort grounds which spans the island. Keep your most important stuff in a money belt at all times. Thankfully, my passport was in my money belt so I can still leave the country. Although, they’ll have to drag me off this island when it comes time to leave. Separate out your money. I only had a couple of USD in my wallet and the rest was safely tucked away in a money belt. Get a second debit card and keep that with your most valued-valuables in your money belt. Take photocopies of all your important cards and documents. I was easily able to call MBNA (for credit card) and CIBC (for debit card) to cancel my cards. MBNA is even FedEx-ing me a card to the Maldives before we set off for India! Maldives is probably the best place to lose your wallet since everything is connected (internet, phone etc) and the staff at Kurumba have been super helpful. After the panic wore off, we took a nap before dinner which ended being a 13 hour coma! After a 30 hour trip across the world, it’s just what we needed so today, we are fully refreshed and ready to…lay on the beach and do nothing! I love the 30 hour coma… now get up have some fuuun you animals. You know this place is for honey-mooners right? Nicely written. makes me want to go too. KFC huh? You guys haven’t left Scarborough yet have you? lost your wallet already??? They are so eager to make sure you still use your card. 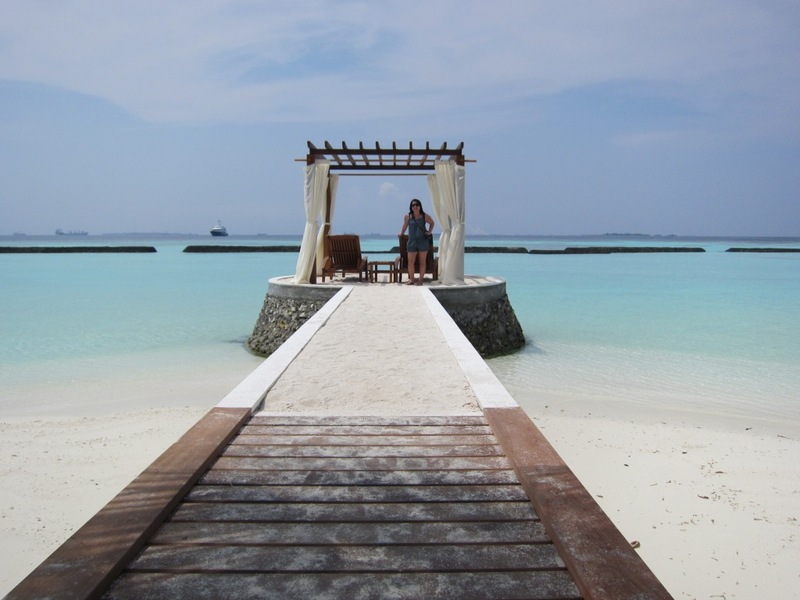 Fedexing it to you in Maldives… that’s like a James Bond service.